Home — The Intelligence Community Inc. 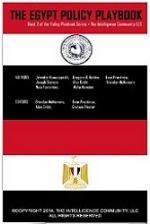 This collection of essays aims to outline the potential options available for policy makers for US-Egyptian relations. 5 simple steps to get hired: know your niche, perfect your pitch, curate your list, leverage weak ties and manage opportunities. In May 2014 a twitter campaign called #saveourgirls captured the attention of the American public by shedding light on the April 14th kidnappings of over 200 school girls by the terrorist group Boko Haram. The Intelligence Community, LLC offers a unique, virtual internship program. Learn more and/or complete an application to join.